I love making gloves, but many knitters I have talked to think they take too long and are hesitant to commit to any project requiring double pointed needles, so behold: a better pair of gloves. 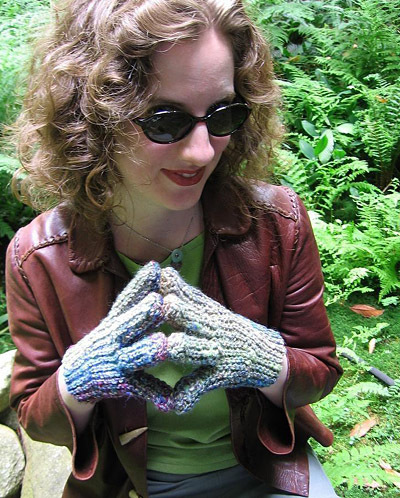 These gloves are worked on straight needles in garter stitch, and each glove can be completed in an evening or two. The yarn gives them a pleasing variegated color and the wrists elegantly close with little buttons. There are many possibilities for this pattern; you could knit it in a fuzzy soft yarn like mohair or angora for a less rustic feel or knit them in wool using stockinette stitch and a large gauge, then felt them a little. They would also look great knit in reverse stocking stitch. These gloves fit hands approximately 7 to 8 inches long from wrist to end of middle finger, with palm circumference (excluding thumb) of 7 to 8 inches. They are quite stretchy and will expand and contract quite a bit, but if your hand size is very different from this, it will be necessary to adjust the pattern. 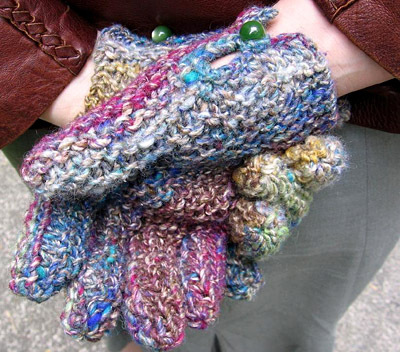 These gloves are worked lengthwise on straight needles, and are shaped using short rows. 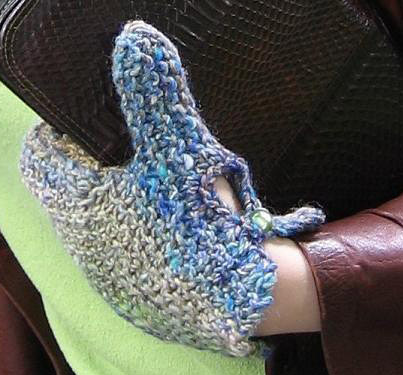 The gloves are cast on along the thumb edge and worked around the hand. Half of each finger is knit while working the first half of the glove, then the stitches are put on holders to be picked up again when working the second half. The remaining side seam of each finger is then grafted together. CO 1 st by making a slip knot and placing it on the needle. K into this st without dropping it from left needle; slip new st to left needle. 2 sts. *K into space between 2 previous sts on left needle; slip new st to left needle. Repeat from * for each subsequent st.
Knit to turning point, turn work to begin working back in the other direction, bring yarn over right needle to back of work, forming a yo (yarn over); you are ready to knit the next row. Knit to the yo, then knit the yo together with the following stitch. This will close the hole that would otherwise be formed by turning the short row. CO 8 sts using Cable Cast On, then CO 11 sts using Crochet Cast On. 19 sts. Row 1 [RS]: K all sts. Row 2 [WS]: K17, turn. Row 3 [RS]: K13, turn. Row 4 [WS]: K to end. Row 5 [RS]: K11, turn. Row 6 [WS]: K to end. Row 7 [RS]: K7, place 7 sts just worked on stitch holder or waste yarn, k to end. Row 8 [WS]: K12, CO 16 sts using Crochet Cast On. 28 sts. Row 9 [RS]: K to end. Row 10 [WS]: K26, turn. Row 11 [RS]: K9, turn. Rows 12-14: K to end. Row 15 [RS]: K10, place 10 sts just worked on stitch holder or waste yarn, k10, turn. Row 16 [WS]: K10, CO 11 sts using Crochet Cast On. 29 sts. Row 17 [RS]: K to end. Row 18 [WS]: K27, turn. Row 19 [RS]: K10, turn. Rows 20-22: K to end. Row 23 [RS]: K11, place 11 sts just worked on stitch holder or waste yarn, k10, turn. Row 25 [RS]: K to end. Row 26 [WS]: K26, turn. Row 27 [RS]: K9, turn. Rows 28-30: K to end. Row 31 [RS]: K13, place 13 sts just worked on stitch holder or waste yarn, k7, turn. Row 33 [RS]: K to end. Row 34 [WS]: K20, turn. Row 35 [RS]: K12, turn. Rows 36-38: K to end. Rows 39 & 40: K to end. Row 41 [RS]: K12, turn. Row 42 [WS]: K10, turn. Rows 43 & 44: K to end. Row 45 [RS]: K7, place 7 sts just worked on stitch holder or waste yarn, k7, turn. Row 46 [WS]: K7, fold work at middle of little finger, place 13 held sts from near side of first half of ring finger on left needle, k to end. 28 sts. Row 47 [RS]: K to end. Row 48 [WS]: K26, turn. Row 49 [RS]: K9, turn. Rows 50-52: K to end. Row 53 [RS]: K10, place 10 sts just worked on stitch holder or waste yarn, k10, turn. Row 54 [WS]: K10, place 11 held sts from near side of first half of middle finger on left needle, k to end. 29 sts. Row 55 [RS]: K to end. Row 56 [WS]: K27, turn. Row 57 [RS]: K10, turn. Rows 58-60: K to end. Row 61 [RS]: K11, place 11 sts just worked on stitch holder or waste yarn, k10, turn. Row 62 [WS]: K10, place 10 held sts from near side of first half of index finger on left needle, k to end. 28 sts. Row 63 [RS]: K to end. Row 64 [WS]: K26, turn. Row 65 [RS]: K9, turn. Rows 66-68: K to end. Row 69 [RS]: K16, place 16 sts just worked on stitch holder or waste yarn, k to end. Row 70 [WS]: K12, place 7 held sts from near side of first half of thumb on left needle, k to end. 19 sts. Row 71 [RS]: K11, turn. Row 72 [WS]: K9, turn. Row 73 [RS]: K13, turn. Rows 74-76: K to end. Row 77 [RS]: K11, place 11 sts just worked on stitch holder or waste yarn, BO rem 8 sts. Work second glove in the same way. Remove crochet chain from cast on and place live sts on needle or double-point needle. Place held sts on needle or double-point needle. Graft sts together in stockinette stitch to form finger. Use yarn tail at base of finger to close hole between fingers. Use yarn tail at end of finger to gather row ends at tip of finger, and pull to close. Important: 8 sts at side of hand, below base of thumb, remain open to form vent. These are the sts that were cast on using the Cable Cast On, and were bound off at the end. Turn glove inside out (this becomes the right side). With crochet hook, work sc around vent; two sts in from one end of vent, [sc, ch5, sc] in one st to form button loop. Finish working sc to end. Sew button to edge of vent opposite button loop. 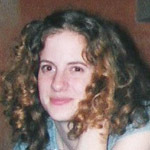 Sarah has just completed her master's degree and now has a real job, which allows her to focus on her knitting. She has been knitting for several years, and though she has been mucking with others' patterns for years, this is her first foray into writing her own knitting patterns.